The Navajo (Diné) are Athabascan-speaking people who migrated to the Southwest from Canada in about the 15th century. Navajo women learned weaving in the mid-1600s from their Pueblo Indian neighbors who had been growing and weaving cotton since about A.D. 800. Spanish settlers had brought their churro sheep to the region in the early 1600s and introduced the Navajo to wool. By the early 1800s, Navajo weavers used wool exclusively, and became well known among both their Indian and Spanish neighbors for finely woven, nearly weatherproof blankets that became popular trade items. Garments, especially wearing blankets, comprised most of the products of early Navajo looms. Traditional, Native-made blankets were wider than long (when the warp was held vertically) and were known as mantas. The Spanish introduced the longer than- wide serape form that was easier to make on European-style looms. Mantas and serapes were generally used in the same way: wrapped around the shoulders with one long edge turned over as a “collar.” However, mantas also were used by women as wraparound dresses. Serapes only rarely had a slit in the middle for the head, which made them ponchos. Navajo weavers made both the manta and serape styles during the 18th and 19th centuries along with shirts, dresses, breechcloths and sashes. These early weavings made before the 1870s are very rare, bringing tens of thousands of dollars—or more—from collectors and museums. The so-called chief’s blanket is a specific style of manta that went through a distinct design evolution. ­First phase blankets were made from about 1800 to 1850 and consisted simply of brown (or blue) and white stripes with the top, bottom and center stripes usually being wider than the others.­ Second phase blankets included small red rectangles at the center and ends of the darker stripes and were made between 1840 to 1870.­ The third phase type, between 1860 and 1880, saw the addition of stepped or serrated diamonds of color to the center and ends of the wide stripes.­ In weavings of the fourth phase, made from 1870 through the early 1900s, diamond motifs became larger and more elaborate, often overtaking the stripes as primary design elements. Revivals of chief’s blankets—usually made as rugs—have been popular since the 1950s. A watershed in Navajo weaving came in the 1860s with the incarceration of about 8,000 men, women and children at Bosque Redondo reservation in eastern New Mexico. In an effort to subdue and “domesticate” the Indians, the U.S. Army slaughtered the Navajo’s sheep and destroyed their crops and homes. The government allowed weaving to continue during the internment by replacing the Navajo’s homegrown wool with factory-made yarns from Europe and the eastern United States. After the Navajo returned to their homelands in 1868, the U.S. government continued to provide commercial yarns as part of their “annuity” support for the Navajo people. In the 1870s, licensed Indian traders began supplying weavers with factory-made yarns brightly colored with aniline (chemical) dyes. Blankets made of these colorful yarns are generically called Germantown weavings after the town in Pennsylvania where much of the yarn was produced. The use of Germantown-type yarns ceased shortly after 1900. The Navajo returned from Bosque Redondo to a very different world, one increasingly tied to the larger Anglo-American economy and culture. Families quickly rebuilt their sheep herds and resumed production of their own hand-spun yarns, although the American merino sheep, which had shorter, greasier wool that was much harder to clean and spin by hand, had replaced the churro sheep. Weavers also found that the market for their blankets was changing rapidly. The trading post system and its ties to the railroad brought relatively cheap manufactured clothing and supplies to the Navajo and surrounding tribes. Anglo-style coats and dresses were replacing wearing blankets as the clothing of choice among Native peoples. Increased difficulty and declining demand took its toll on both the weavers and their product. During the last two decades of the 19th century, most Navajo blankets were woven of spongy, loosely spun yarns most frequently dyed with aniline reds, oranges and yellows. Besides the chief’s blanket mantas, two types of serape blankets predominated in this period. 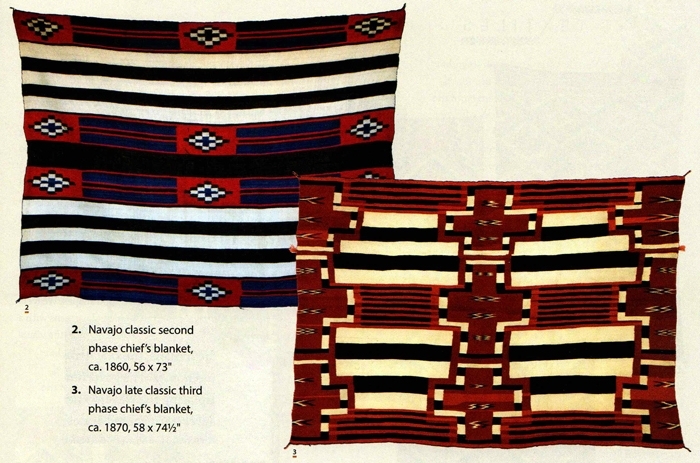 Banded blankets made with simple stripes of contrasting color were descendants of the earliest Navajo weavings. A more complicated type of design was derived from Hispanic saltillo serapes, which featured brightly colored patterns of serrated diamond shapes. Weavers frequently outlined the small, serrated patterns with a single yarn of contrasting color to heighten the visual complexity and impact. This patterning technique became known as the eye dazzler and continues to be popular to the present day. Both the banded and diamond pattern homespun blankets of the late 19th century are generically known as transitional blankets because they signaled the end of Navajo blanket production and ushered in the era of the Navajo rug. By the 1890s, the internal demand for Navajo weaving was almost non-existent. To make matters worse, a widespread financial panic seized the U.S. economy in 1893, depressing commodity prices for the raw wool that had come to replace weavings as the Navajo’s primary trade item. During this difficult time, several traders realized that there could be an external market for Navajo weavings made as rugs rather than blankets. The nascent market for Indian rugs was fueled at the turn of the century by a growing national interest in Native peoples and artifacts. Well-heeled tourists to the Southwest wanted unique souvenirs of the exotic places and peoples they visited, and rugs could easily be incorporated into the highly eclectic and overstuffed interiors of the period. The rug market was not limited to tourists, however. Many people who would never visit the reservation appreciated the exotic designs and laborious handcraftsmanship of Navajo weaving. Proponents of the Arts and Crafts design movement found that the bold, geometric designs harmonized beautifully with their simple furniture and handmade accessories. By 1896, C.N. Cotton, a trader in Gallup, New Mexico, had issued a catalog in an effort to expand his market to eastern retailers. 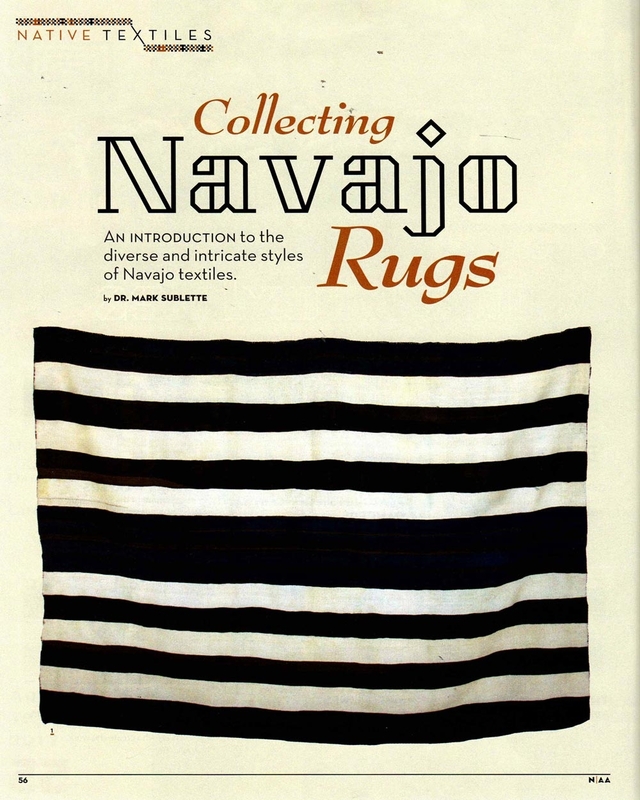 Other traders, most notably Lorenzo Hubble in Ganado, Arizona, and J.B. Moore in Crystal, New Mexico, followed up with their own catalogs in the early years of the new century, focusing specifically on rugs. Navajo weaving had quickly gained a national audience. From the 1880s through 1930s, reservation traders were the Navajos’ primary contact with the outside world. As such, they also were the weavers’ primary or even sole-customers. Therefore traders exercised significant influence on weavings simply by paying more for the designs, sizes, colors and qualities they wanted. Of course, traders’ choices were driven by what they thought they could sell to their off reservation customers, but they also were guided by their own aesthetic sensibilities. 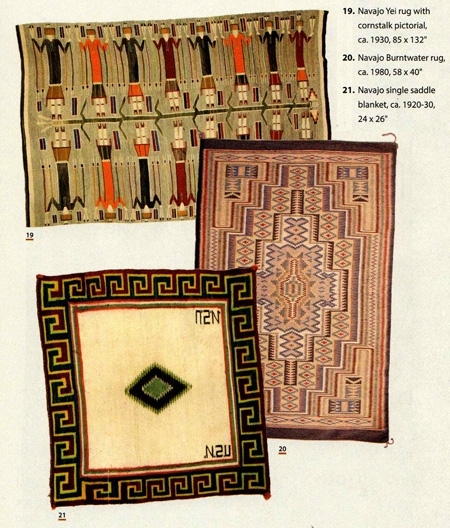 As a result, distinctive styles of rugs emerged around several trading posts in the first years of the 20th century. Such combinations of pattern and color are known as regional styles and are typically named after the trading post that encouraged their production. It should be noted, however, that many rugs produced throughout the century did not conform to a particular regional style and are now difficult to assign to a specific trading post. In recent years, as weavers have become more mobile and independent of local trading posts, they often choose to weave patterns originated outside of their area. Many also combine motifs and characteristics from several different regions. As a result, the regional style names are now mostly used to identify common pattern types without necessarily referring to the exact place of origin of a specific weaving. Juan Lorenzo Hubbell was, by most accounts, the leading trader of the early period in rug-making, and owned several trading posts around the reservation. Hubbell’s home and base of operation were at Ganado, Arizona, about 50 miles south of Canyon de Chelly. His tastes ran to classic period weavings and many of the early rugs made by Ganado-area weavers were close enough in appearance to classic mantas and serapes to have earned the generic name, Hubbell Revival rugs. Hubbell guided his weavers by displaying paintings of rug patterns he favored. Many of these paintings can still be seen at the original trading post, now preserved and operated as a National Historic Site. Hubbell preferred a color scheme of red, white and black, with natural grays. By the 1930s, Ganado-area weavers had thoroughly adopted the color scheme, but had moved away from classic-inspired weavings to new patterns with a large central motif—often a complicated diamond or lozenge shape—with a double or triple geometric border. These rugs frequently had a deep red “ground” or field on which the central motif was superimposed, and are now known as the Ganado regional style. Weavers around the nearby trading post at Klagetoh, Arizona, (also owned by Hubbell) often worked in the same colors and patterns, but reversed the color scheme and used a gray ground with red, white and black central motifs. The Ganado- and Klagetoh style rugs continue to be made to this day and are among the most popular of all Navajo rug designs. J.B. Moore, who owned the trading post at Crystal, New Mexico, from 1897 1911, was another visionary trader who exercised enormous influence over early Navajo rug design. Perhaps his most important innovation was to introduce weavers in his region to Oriental rug patterns. Rather than copying wholesale, the Navajo filtered the new patterns through their own cultural sensibilities and personal design preferences. In the process, they drew out specific concepts and motifs, re-synthesizing them into distinctly Navajo designs. Motifs probably derived from Oriental rugs include repeated hook shapes (often called “latch hooks”), the waterbug shaped like an X with a bar through the middle, the “airplane” or T-shape with rounded ends and, in a small number of weavings, rosettes. An even more lasting and fundamental influence was the concept of a large central motif in one, two or three parts that covers almost all of the ground between the borders. Even the concept of the border itself, usually in two or three layers with at least one in a geometric pattern, is probably traceable to Oriental carpet design. Though introduced in the region around Crystal, these motifs and ideas quickly spread to other areas of the reservation and are found on many rugs woven throughout the past century. 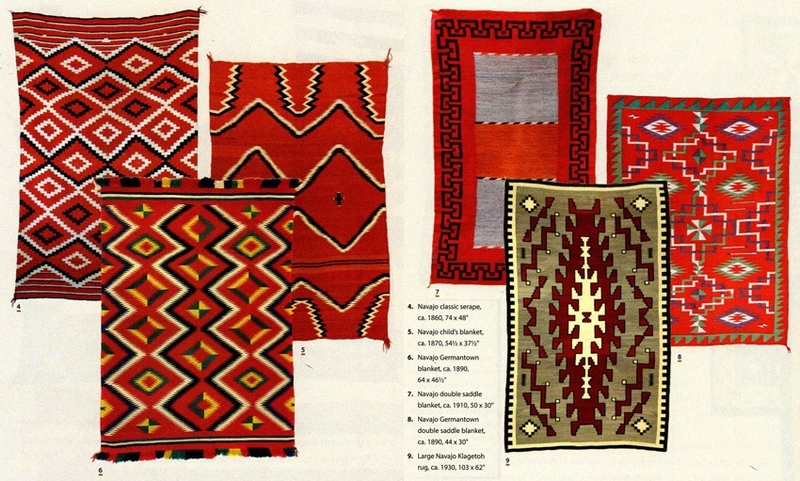 Moore’s influence on Navajo rugs was not only widespread but of long duration. Designs his weavers developed before 1911 were still being made, virtually unchanged, as late as the 1950s. These Oriental-influenced patterns are now known as Early Crystal rugs. Those made at the beginning of the century typically featured aniline red with natural whites, browns and grays, while rugs made from the 1920s on tended to rely even more heavily on a wide range of natural wool colors. One of the most popular designs that likely resulted from Moore’s work at Crystal was the storm pattern. It is generally defined as a central rectangle connected by zigzag lines to smaller rectangles in each corner. The storm pattern often is said to have symbolic meaning: the zigzags are lightning, the corner rectangles are the four sacred mountains of the Navajo or the four directions or the four winds, etc. evertheless, the great variety of interpretations suggests that meanings were assigned by traders and collectors, not by the Navajo themselves. The storm pattern’s precise origin is uncertain—one story suggests it was developed by a trader on the western side of the reservation but the weavers at Crystal developed this concept into one of the most popular and lasting of all Navajo rug patterns. Not far from Crystal was the Two Grey Hills trading post, known for weavings in which no dyes were used. Instead, weavers carefully combed and spun different natural colors of yarn to yield a beautiful range of creamy whites, tans, browns and grays. (To get a solid black color, weavers sometimes would over dye dark brown wool with black dye.) The weavers around Two Grey Hills developed very complex geometric patterns, usually based on a large, hooked central diamond with multiple geometric borders. They also were known for very finely spun wool of small diameter, which they used to make very thin, dense and tightly woven rugs that are certainly the greatest technical achievements in the history of Navajo rug making. Many of the women who weave for nearby Toadlena Trading Post carry on this tradition of quality. The most finely woven rugs are often called tapestry rugs. Beginning in the 1920s, weavers and traders developed several new regional styles based on a revival of early banded patterns and the predominant use of vegetal dyes. The impetus behind this trend came primarily from Anglo collectors, traders and government agencies that had a sincere desire to upgrade the quality of Navajo weaving and return to traditional, pre-rug patterns. The resulting rugs were not literal copies of older pieces, but were creative variations on banded designs using a wide palette of newly developed vegetal dye colors made from indigenous plants, as well as new, subtly colored chemical dyes. Mary Cabot Wheelwright, founder of the Wheelwright Museum in Santa Fe, probably started the “vegetal revival” by providing weavers around Chinle, Arizona, with the new dyes and sketches of old weavings. Chinle Revival rugs typically feature bands of repeating geometric motifs alternated with plain or striped bands of contrasting colors. Common colors for Chinle rugs include yellow, gold, brown, tan, terra cotta, soft pink and other earth tones, as well as natural wool colors ranging from white to black. About the time of World War II, Crystal-area weavers developed their own banded revival rugs bearing no resemblance to Moore’s early designs. Generally known as Modern Crystal rugs, these borderless patterns often combine vegetal and aniline colors in shades of brown, yellow, and terra cotta with natural greys and whites. One of the characteristics commonly associated with Modern Crystals is the “wavy line” pattern. This is accomplished by alternating weft threads of two contrasting colors and tightly “battening” or packing them together, giving the effect of a thin, undulating line. Starting in the 1940s, Sally and William Lippincott, owners of the trading post at Wide Ruins, Arizona, worked with the weavers in their area to develop highly detailed banded patterns rendered in vegetal dyes. Most Wide Ruins rugs are characterized by very fine, tightly spun yarns and a flat, even weave. They feature the full range of new vegetal colors including soft green, mauve, terra cotta, and pale purple, pink and blue as well as the more common yellow, gold, brown and tan. Burntwater, another center of vegetal dye weaving near Wide Ruins, has given its name to a distinctive rug type, which combines the bordered, central geometric designs of modern Ganado and Two Grey Hills rugs with bright pastel, vegetal colors. Weavings that incorporate images of objects and people in their designs have slowly gained in popularity since the early days of rug-making. Such pictorial rugs may include small representational images within a larger geometric design, or may consist primarily—even solely—of a picture. Small pictorial motifs such as feathers, arrows, animals and other common objects may have held some personal significance for the individual weaver. As the modern trappings of Anglo culture filtered onto the reservation, strange new objects such as cattle, trains, American flags and letters of the alphabet caught the fancy of some weavers. Pictorials made before the 1940s are relatively uncommon and usually command a premium price from collectors. After World War II, however, more weavers began making pictorial weavings, frequently filling a small rug with a single scene. Types that have been especially popular since the 1970s include landscape scenes, which usually feature red cliffs or mountains, blue sky and clouds, juniper and pine trees, hogans, farm animals, trucks and people. Another common format is called the Tree of Life pattern, consisting of a corn stalk rising from a Navajo wedding basket, with birds adorning the leaves of the cornstalk. Despite the obvious symbolism of patterns such as the Tree of Life, most pictorial motifs had no specific religious meaning; they simply were objects common in the culture or of special interest to the weaver. The major exceptions to this rule, however, were weavings that portrayed Yeis, or Navajo Holy People, and weavings that recreated sacred ceremonial sand paintings. A small number of weavers made sand painting rugs as early as the 1890s in the area around Two Grey Hills. Most famously, the medicine man Hosteen Klah made a series of sand painting rugs with the help of his mother and nieces between 1919 and 1936. Nevertheless, sand painting rugs were very rare before the 1960s when weavers in the Ganado area began producing them in larger numbers. Although they are not sacred objects in themselves, rugs showing sacred sand painting images have always been somewhat controversial within the Navajo community, and many weavers still decline to make such representations. Yei pattern rugs feature images of the Holy People drawn from ceremonial sand paintings but do not recreate an entire painting. 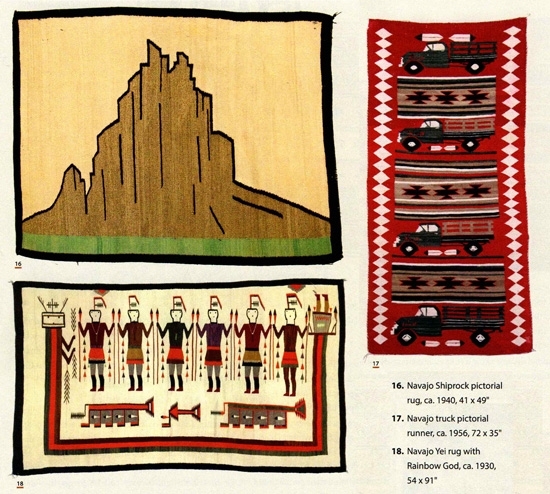 The closely related Yeibechai rugs show Navajo dancers in the act of portraying Yeis in ceremonies. Typically, the Yeis are highly stylized figures with elongated bodies, short straight legs, and heads facing the viewer. Yebechais have more human proportions, usually face sideways,and have legs bent in a dancing motion. The most common types of Yei and Yeibechai rugs feature multiple figures oriented parallel with the weft threads so that the rug appears wider than long when the figures are upright. Two distinct styles emerged in the 1920s. Those made in the area of Shiprock, New Mexico, tend to have light-colored backgrounds with no border, and often use brightly colored commercial yarns. Yeis and Yeibechais made in the central part of the reservation (northeastern Arizona) tend to have dark backgrounds with simple borders. They are more likely to incorporate natural wool colors and more subdued chemical shades. Yeis continue to be very popular with collectors and are now being made in nearly all parts of the reservation. Although rugs have been the predominant product of Navajo looms over past century, weavers have continued to make other types of products, if on a smaller scale. Navajo cultural thoroughly embraced the horse in the late 19th century, and saddle blankets were commonly produced until the 1950s. Single saddle blankets were roughly 30-inch square. Double saddle blankets were of similar width, but about twice as long and were doubled over when in use to provide extra padding. Early saddle blankets often were woven in simple striped patterns, and double saddle blankets now are sometimes difficult to distinguish from transitional wearing blankets. By the end of the period, saddle blankets frequently had patterns only at the corners or edges since only those parts of the blanket were visible when in use. Double saddle blankets sometimes had a different pattern on each half. Fancy saddle blankets, often featuring bright colors, elaborate patterns and fringes, were probably more for show than function. Evidence suggests they often were tied to the saddle skirt behind the cantle rather than being placed under the saddle. During the first several decades of the 20th century, weavers near railroad stops and tourist centers made small, loosely woven, pictorial mats. Now known as Gallup throws, these inexpensive items were a favorite, easy to transport souvenir among visitors to the southwest. Pictorial and geometric “rugs,” too small for use on the floor and typically made with commercially spun and dyed yarns, remain a staple of the souvenir trade to this day. Weaving techniques in the rug period have primarily been limited to the standard tapestry weave, which is identical on both sides. (This term should not be confused with “tapestry rugs” from Two Grey Hills.) nevertheless, some weavers still practice the more difficult twill weaves, including rare two-faced weavings, which have a different twill pattern on each side. In the 1960s, weavers in the area of Coal Mine Mesa in Arizona popularized an unusual technique called raised outline in which the joints between color areas are thicker and appear to rise above the surface of the weaving. Most raised outline rugs also use the technique of alternating single weft threads of two contrasting colors. When tightly battened, they give the appearance of very thin stripes running parallel to each warp thread. As with any collecting specialty, there is so much to learn about Navajo weaving that it can seem overwhelming for the beginner. The best way to learn is to look at as many weavings as you can in galleries and museums, and don’t be afraid to ask questions! Soon you’ll be matching the terminology to the weavings and you’ll begin to feel a surge of confidence. When you decide to buy, focus on a reputable dealer who will take time to answer all your questions simply and directly, and make sure they are willing to give you a written guarantee of authenticity.